Seattle author Angela Garbes takes on pregnancy culture in her new book, “Like A Mother: A Feminist Journey Through the Science and Culture of Pregnancy,” from the hierarchy of the “natural” birth to the relative risk of drinking a glass of wine. What can you really expect when you’re expecting? Upbeat lectures on doing the best for your baby. Tips and tricks! Weekly updates comparing the fetus to a poppy seed/grape/lime/pineapple. There’s a deeper hunger out there, as Angela Garbes found, to know what’s really happening in the “vast, internal world” of mother and child. The article from the new mom went viral, becoming the most-read in the paper’s history. That led to a broader new book: “Like A Mother: A Feminist Journey Through the Science and Culture of Pregnancy” (Harper Collins, $24.99). During her own first pregnancy, overwhelmed by well-meaning but nuance-free best-sellers, she found comfort in a graphic novel titled “Pregnant Butch: Nine Long Months Spent In Drag.” As a butch lesbian, author A.K. Summers led a vastly different life, but offered an emotional undercurrent Garbes’ own “leaky, weary” self could appreciate. If Garbes has goals to change that pregnancy culture in America, a big one is that more mothers of all types might feel cared for, and fewer will feel alone. 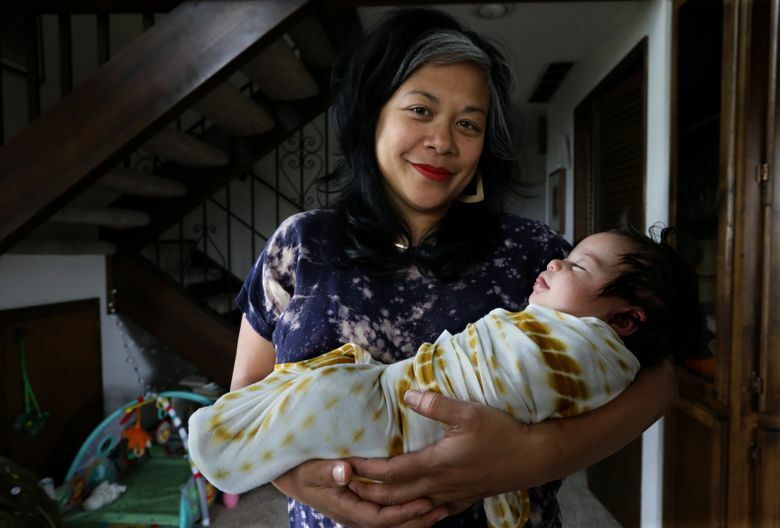 “I would love for people to read this book, for mothers to read this and think, ‘I’m not the only person who’s going through this or feeling this,’ ” Garbes said from the Beacon Hill home she shares with husband Will, 3-year-old daughter Noli and newborn Ligaya. Both pregnancy and research enlarged her own perspective considerably, leaving her with two children and one book — a very personal mix of memoir and investigation including miscarriage, the relative risk of drinking a glass of wine, “microchimeric” fetal cells, parenting roles and placentas (the one that joined her to Noli was, post-birth, steamed lightly in a Dutch oven lined with fresh ginger, lemons and sliced jalapeños). The science is sublime. I especially appreciated, oddly, learning how much we still don’t know about the high-stakes path to parenthood. But what got me was Garbes’ regard for mothers as people in their own right, rather than the hosts or self-sacrificing caregivers they’re conditioned to be. “When I was writing this book, I kept thinking, ‘Who gets left out?’ Women are always left out of the conversation, nonwhite women even more so,” she said. As a food writer, Garbes had sought out smaller categories of under-the-radar people, chronicling a family dinner of whole fried catfish and a Seattle-wide search for Laotian pork sausage, skewering the lazy phrase “Asian fusion” and introducing the city’s leading black chefs. The focus fit in with her own history. “Because I’m brown, because I’m Filipina, because my parents are immigrants and I grew up in a small town in Pennsylvania that was mostly white, I learned pretty early on that we were different …” she said. Before taking on a job at The Stranger she had actually quit writing professionally, enrolling instead in a graduate program in public health. Noli was born by C-section after a difficult and dangerous labor, giving Garbes firsthand opinions on the strange hierarchies society suggests for “natural” births. “The baby comes out of your body. That’s the way it’s supposed to be. Does it matter, really, how?” she said. Strange how radical such words feel, and how right. Rebekah Denn is a Seattle freelance writer. Reach her at rebekahdenn@gmail.com.